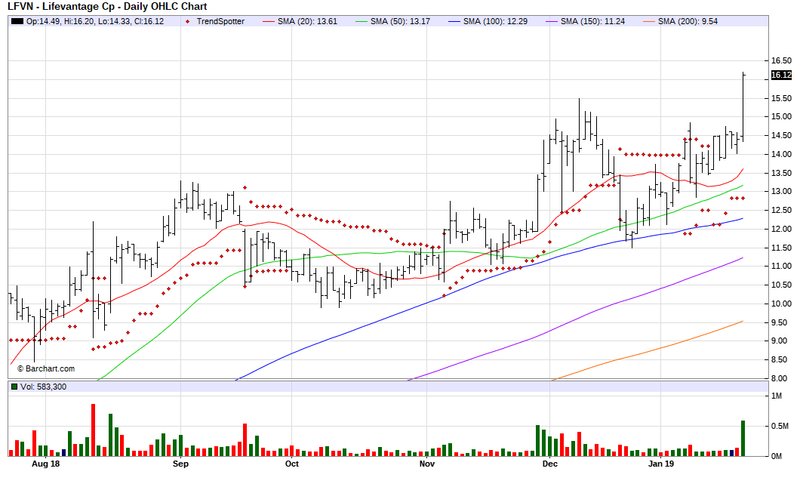 The Barchart Chart of the Day belongs to the health food supplement company LifeVantage (LFVN). I found the stock by sorting Barchart's New 52 Week Highlist by the most frequent number of new highs in the last month, then used the Flipchart feature to review the charts for consistent price appreciation. Since the Trend Spotter signaled a buy in 1/15 the stock gained 11.25%. LifeVantage Corporation is a health and nutrition company. The company is the maker of Protandim(R), the Nrf2 Synergizer(R) patented dietary supplement, the TrueScience(TM) Anti-Aging Skin Care Regimen, Canine Health and the AXIO(TM) energy product line. LifeVantage Corporation is headquartered in Salt Lake City, Utah. Disclosure: I/we have no positions in any stocks mentioned, but may initiate a long position in LFVN over the next 72 hours.